A scathing op-ed that reeks of treason was published in The New York Times Wednesday. 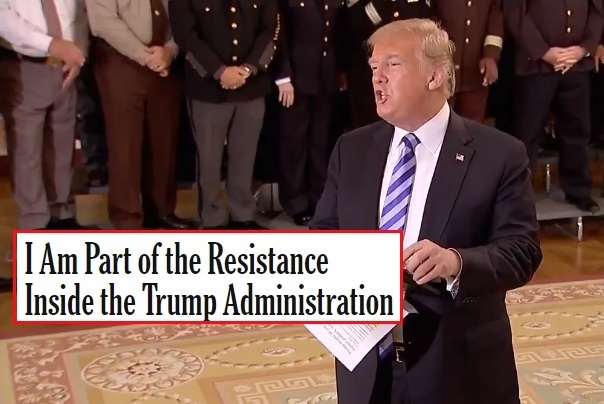 The piece was titled, "I Am Part of the Resistance Inside the Trump Administration" and the author claims to be a current employee at the White House. Reporters jumped at the opportunity to bring up the op-ed to Trump at a law enforcement meeting and this was his response. The op-ed in The New York Times prompted anger within the White House as one of their own staff stabbed them in the back. President Trump called the piece "gutless" and Press Secretary Sarah Sanders called on the author of the article outlining their attempts to undermine the Trump presidency to resign. The New York Times Twitter account seems to imply the author is a man but a spokesperson for the company said the tweet was "was drafted by someone who is not aware of the author's identity, including the gender, so the use of 'he' was an error." Trump was inundated by requests for comment regarding the betrayal while at a White House meeting with sheriffs from across the country. "If I weren't here, I believe the New York Times probably wouldn't exist," Trump said drawing some laughter and applause. "And someday when I'm not president, which hopefully will be in about six-and-a-half years from now, The New York Times and CNN and all of these phony media outlets will be out of business … because there'll be nothing to write." Sarah Sanders also commented on the piece saying the author was "a gutless, anonymous source to the failing New York Times." Sanders continued, "We are disappointed, but not surprised, that the paper chose to publish this pathetic, reckless, and selfish op-ed. This is a new low for the so-called 'paper of record,' and it should issue an apology." She continued, "The individual behind this piece has chosen to deceive, rather than support, the duly elected President of the United States. He is not putting country first, but putting himself and his ego ahead of the will of the American people. This coward should do the right thing and resign." So the media is grasping at using attempts to shake up Trumps staff and instill suspision amougst them. If this were true then Secret Service is asleep or bed by Hillary. Until a spy is uncovered I will view such stories as bait click for a desperate CNN/MSM Fiction mill.